Having had to grow a new lawn in 2 areas covering around 2000sq ft we really needed some sort of sprinkler timer system. I had actually spent some time searching online to see what it would take to put an in-ground system in at one point. Although most of the components are extremely price friendly, there are a couple which are not. The first is the sprinkler system timer, and the second is the back-flow prevention valve which can run up to $300 in itself on top of the rest of your system. Add in the additional digging and modifying your plumbing, etc, it’s a lot of work and perhaps a job better after settling in for a couple of years. We ended up going with some garden / home improvement store variety water timers / sprinkler timers that you just hook your hose to. 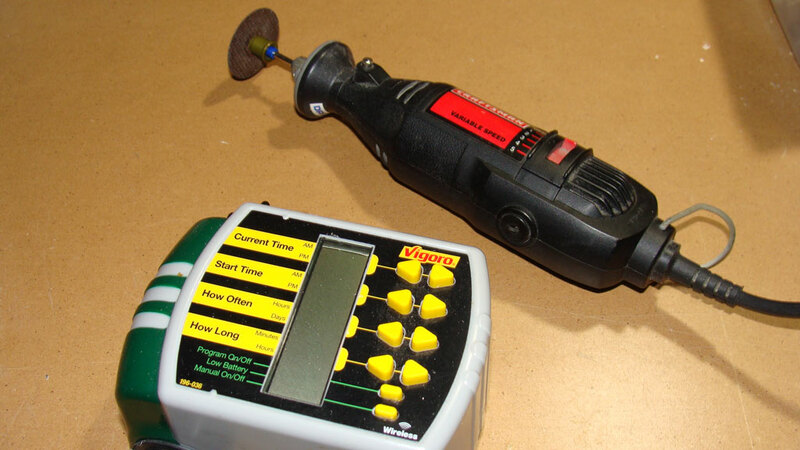 The first one we purchased was a ‘Vigoro Model 3015v’ (same as Melnor) branded item which had a lot of programming flexibility, manual override and, in this package, the moisture sensor. The water timer without the rain sensor function is $26.30 at Amazon . (not the number of ‘review stars’ in the amazon popup when you hover over that link) The one with the water sensor is pictured below. Overall this seemed like a pretty good timer. It has a lot of flexibility in the programming schedule. You set the current time (in hours only) and set the start time (in hours only). You then program how often the timer will open the valve in hours or days to water your lawn, and for how long it will do it each time, in minutes, or hours. While the water pressure had improved with the 4-way hose splitter it was still weak, this of course is not the sprinkler timers fault but just additional useful information if you’re trying to water a large area with multiple sprinklers. The rain sensor / moisture sensor did a reasonable job, and lets you adjust how sensitive to ground moisture it is. The setting varies from 1 water drop to 3 water drops to tell the system how wet you want your ground to be. If the moisture sensor detects that your lawn is wet, to the level you selected, the main unit will bypass any sprinkling times until your lawn dries out enough to require watering again. The rain sensor is great as it prevents the system from watering your lawn when it has rained recently, saving you money and possibly sparing you the dirty looks from your enviro-conscious-neighbors if your sprinklers happen to turn on during a torrential downpour! Special Note: Attach your hose to this unit before attaching the wireless receiving antenna. Speaking from experience it is much more difficult to get the hose on when the antennas is attached! Pros: Simple to setup, manual override, reliable, easy to read. Cons: Splits hours evenly. a 6/noon/6 schedule is not possible, you only get a midnight/6/noon/6 schedule, and I didn’t want to water our lawn at midnight and I didn’t want to water too early in the morning, or too late at night like I could achieve with an 3 x 8hr schedule. This unit has received terrible reviews in general. After messing with the Vigoro sprinkler timer and having the water pressure problems as well as the ‘watering at midnight’ problem due to limited timer configurations with that unit I decided to go to Lowe’s and see what they had in the way of a timer with multiple zones. Well, there wasn’t a lot available other than this Orbit ‘Complete Yard Watering Kit’. In all honestly it didn’t come with the 300 feet of hose or 5 25 dollar sprinklers so I’m not sure how ‘complete’ I would say it was. It did come with a 4 way valve manifold, the timer module and 2 electronic valves, expandable to 4 (additional valves are 12.95, mail order only from Lowe’s site and rarely in some stores). This timer seems pretty well built, and it’s pretty easy to setup. It is somewhat the same parameters as the Vigoro module above with the addition of individual zones. As an added bonus, they seemed to know you did not want to water your lawn at midnight, and it allows you to set a schedule for 6am, Noon and 6pm, and to skip any overnight watering possibilities. GOOD IDEA! With the addition of multiple valves, you have multiple sprinkler zones. I split the sprinklers down into 2 watering zones for the main peninsula lawn and set the timer to run both sets of control valves, one at a time, for 20 minutes during each watering period for the new lawn. It works great and reliably. I like this timer much better, but it has it’s own problems as well. While the programmable portion of the timer is pretty great. The fact that you have to buy additional zone valves via mail order only is kind of a lame, but not impassable barrier. Additionally in manual mode it would have been a nice feature to be able to set individual times for each zone. With this module you can turn on one sprinkler zone for X minutes. Or alternately you can turn on all zones for X minutes. You cannot set Zone 1 for 10 minutes, Zone 2 for 20 minutes, Zone 3 for 10 minutes, etc. Pros: Very flexible timing options and multiple zones. Expands up to 4 valves and is reliable. While discontinued the additional valves are still currently available. Cons: You can only buy sprinkler zone control valves through mail-order. I have received and viewed some reports regarding the reliability of the reviewed unit in a poor light and in fact when I changed the batteries the unit died on the spot but in general Orbit has better product reviews than the Melnor products Vigoro re-brands. I wasted so much time and money with these sprinkler timers that we might have been better off trenching and putting in our own sprinkler system. By the time we got everything taken care of working right, the amount of money spent on sprinklers, hoses, timers, watering at weird hours, etc could have just been resolved with a real sprinkler system with an indoor based multi-zone timer for a couple hundred more. Perhaps next year, things are working okay for now but not optimal. If you’re not able to do your own sprinkler system installation, then these may be the way to go, if you’re just being kinda lazy you may wind up regret it. If you are looking for a short term solution for a sprinkler timer then I think these two models can provide you temporary relief. If you’re looking for something that is going to last you longer and multiple seasons, you might want to look at other sprinkler timers. I’ve found that while the particular multi-zone Orbit I reviewed has higher failure complaints, their smaller single zone units have a bit better reputation such as the Orbit 91213 or the Orbit 62001 which has been getting excellent reviews. If you want longer life from your timer, don’t leave it or the valves out over the winter. When you change the battery it may be beneficial to rub something like petroleum jelly over the rubber seal on the battery compartment to help it seal better. If you buy a unit that doesn’t have a sealed battery compartment, take it back. 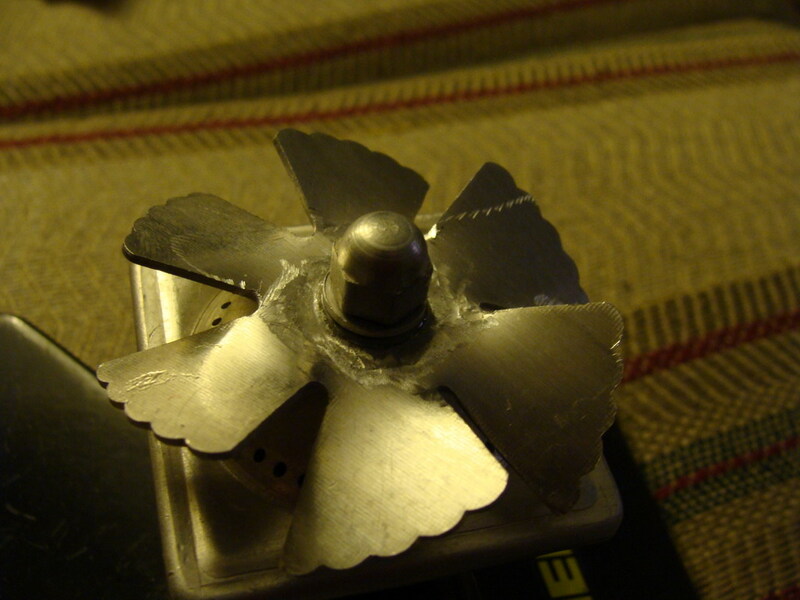 If you liked this post, please see my other Lawn Related Posts and also my new article where I disassemble the Vigoro 3015v to see how the valve works. I’ve tried to keep this post updated with recent information based on feedback from readers and information I find from other review sites and reviewers so that my readers can be better informed on their choices. I last updated this page on June 7, 2011. 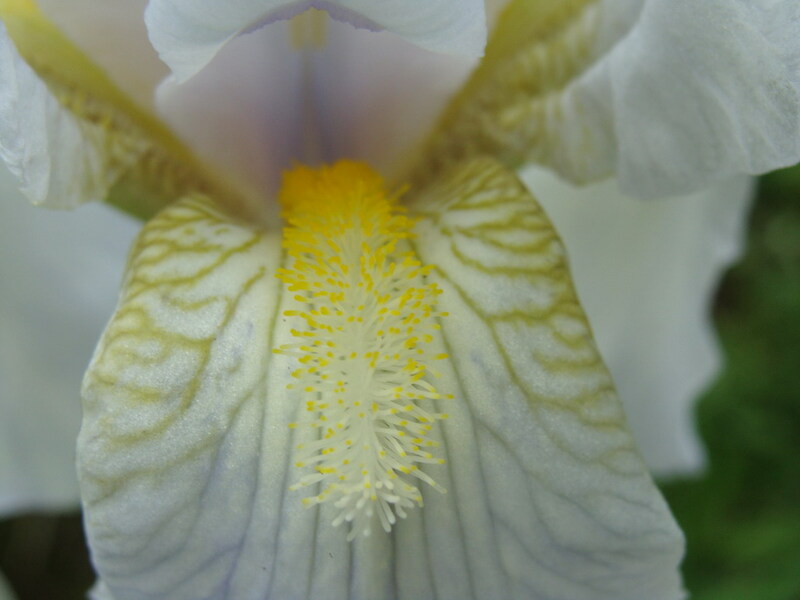 Best of luck with your lawns and gardens this Spring and Summer. I have Vigoro Two Zone Water Timer. When I replaced batteries, it continued to show “low battery”. Has anyone else experienced this, and if so, how was it resolved? I would recommend checking the battery contacts inside the and make sure they don’t have any corrosion on them, they should be shiny metal. If they look corroded you can rub on them with a pencil eraser to help clean them up. I have on occasion also received ‘new’ batteries which were so old that they were dead so that might be something to double check as well. Good luck Phyllis! I have a small pond about 3750 gallon. I would like to link the Vigoro wireless moisture sensor to the timer to keep the pool at the proper level. Can I just support the sensor spike at the proper position? That’s an interesting use for the timer, it would probably work, you could set it to water every hour for 1 hour, and if the sensor is dry, it will turn on until it’s not. The only problem I see with this is that if the battery in the sensor dies, the timer will just disable the sensor feature and go with it’s timing, so you could end up overflowing the pool. If you could go with something like a float valve you would be better off in the long run. I did a quick search for ‘float valve, pond’ on Google and turned up this as one of the first results. I don’t know anything about the company, and can’t recommend them, but if you have garden/pond supply shop nearby you might be able to find them locally as well. Hi Jon – Thank you for your interest and response. I would probably only set the timer for about 15 minutes a day to lessen the overfill problem. As far as a float valve goes, I have considered that for the long run, I could even use a toilet tank in the basement at the proper elevation and a pvc line under ground to the pool below the water line. My problems are a 16″ concrete foundation and about 16′ Bominite stamped concrete drive. I am going to try the Vigoro / Orbit. For the short run to keep the bog plants from frying. I am having battery issues with my Vigoro two zone timer as Phyllis stated. I purchased two timers last year – each used a 9v battery and seemed to work fine. I purchased three additional timers this spring that use 4 AA batteries and have continual battery issues. I have purchased 4 packages of AA batteries as of today – Eveready and Duracell – thinking that they may have been outdated. The terminals are new and clean, the area where the batteries are inserted is dry, the batteries are new (again), and still the low battery light is blinking and the timer is not working. I have returned one timer. Unfortunately, I did not keep receipts for all of them. Hi Pam, I’m just curious if this is the 2 zone model that has the ring of buttons with one in the middle and the big display to the left of them? I absolutely love my Orbit Yard Watering Kit! It will water for different durations if you set your programmed times in RUN TIME and then use the default ALL when turning it on manually. Works great! I have a Vigoro wireless watering system. New last summer. It worked great all summer. This year I hooked it up and it still works but, there are 3 small holes on the back that I,m not sure what they are for, but they discharge full streams of water when the timer is activated . What,s my priblem? Hi Jerry, it sounds like the internal solenoid valve has sprung a leak. It’s possible that that your valve has become cracked (do you get cold winters, and was there water in it over the winter?) or damaged in some other to let water flow out of it and into the case instead of just limiting it to the in/out ports for the hose. I have the same problem with my 3015v. Water coming out of the three little holes in the back. Is there anything to do about it, or should I just throw it out and try something else? Hi Mary, if it’s leaking water I would just toss it. Even if it does work with the leak, it’s wasting water and money. IF YOU ARE GETTING WATER COMING THRUE THE HOLES THAT MANS THE WATHER HAS BREACK THE JOINS BETWEEN THE PLASTIC TUBING INSIDE THE UNIT, I HAD THE SAME PROBLEM WITH 3 ORBIT UNITS, AFTER WINTER EVEN DO I KEEPT THEM INSIDE MY HOUSE, ANY WAYS THEY BROKE, I DON’T KNOW WHY BECAUSE THEY WHERE PROPERLY DRYED AND DRYNED BEFORE STORAGING.i CALL ORBIT TECH. SUPPORT AND THEY JUST REPLACE THEM FOR ME AND I AM STILL WAYTING FOR THEM TO ARRYVE, I WENT TO THE HOME DEPPOT AND BUY A VIGORO UNIT I CONNECTED AND IS WORKING FINE FOR NOW. I DONT KNOW IF THE VIGORO COMPANY HAS A GOOD SERVICE A ORBIT, I HOPE THEY WILL BE BEHIND THEIR PRODUCT, MY SUGESTION IS: CALL THEM AND ASK FOR REPLACEMENT. GOOD LOOK. Will the Vigoro 3015v water timer work on a gravity feed from a barrel to water remote apple trees? We have a new one and even on manual open I hear a clicking noise inside the unit but no water comes out? I can’t speak specifically to the requirements of thae valve inside of the timer, but I know stand-alone valves usually have a minimum pressure requirement. A lot of them start at 20PSI on up, though I see orbit makes some stand-alone low pressure valves some ‘ultra low pressure’ valves can operate as low as 4.5psi. If you have a collection barrel you would need to raise the barrel 2.31 feet in the air for 1 psi. For 20psi that would mean keeping your tank at 40+ feet. If you had a timer and a 4.5psi standalone valve than that’s about 10.5 feet in altitude. I just did a little bit of research, I couldn’t find specs for a Vigoro, but I did find specs for an Orbit (I’ve seen some Orbit products resold as Vigoro) So, if that’s anything to go by the specs say 10psi min and 80psi max. I know this won’t solve your problem, but at least now you know why it doesn’t work. I’m guessing that the valve has a return spring of some sort which helps close the valve and if that is the case then your water pressure is not high enough and it may not be able to overcome the spring. 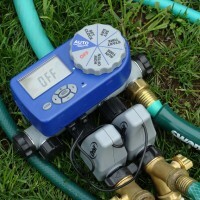 I just purchased the orbit yard watering system(labeled as a Vigoro). I have it set up for zone 2 and 3 for automatic watering, but when I use the manual setting I can only select an individual zone and then a time for that zone. When I select All, only zone 2 come on. If I manually select 3 then 3 does come on, but I can’t get 2 and 3 at the same time. The manual is not clear about how to manually operate both or All zones. Hi JeffN, these timers do a zone at a time. Karl Connolly said further up the page that you set the times in the Run Time area and then set the zones to ‘all’ in manual watering. The timer will then run one zone for the set time period and then the next in order. If you set the times for unused zones to zero it should bypass them. Hope this helps, if not, post again! JeffN – I had the same problem as Jerry – I’m so bummed,because I really want to use the timer again and don’t want to buy a new one (my husband doesn’t think the amount of veggies I get from the garden will be worth the cost). Is there anything I can do to fix it? If I try to open the housing, will it destroy any chance I have of exchanging it? Hi Barbara, did you leave your sprinkler timer outside over a cold winter? I’m just curious since this is the second one I’ve heard of, just on my blog alone. Opening it probably would void any warranty you might have. I would certainly recommend checking your warranty to see if it’s still in effect before opening the timer, if you decide open it and check it out and it’s obvious that you’ve opened it, then any warranty could be void. At last! Someone who unedratsnds! Thanks for posting! I have the “orbit” 49 dollar version which had the VIGORO brand name on it. This unit seems to have a mind of it’s own! I set the front lawn timer for 6 AM and at a duration of one hour. The back yard is set to come on at 7 30 AM and last for one hour. Here’s what happens instead. The front goes on at 6 AM lasts an hour then the back comes on at 930 and shuts off after one hour. nO big deal except that the front then comes back on and lasts another hour! A few days ago the back came on again after the front went off and wouldn’t shut off at all! Grrrr! I have pressed “reset” button with a paper clip and tried every combo of settings that you could well imagine. Same result! 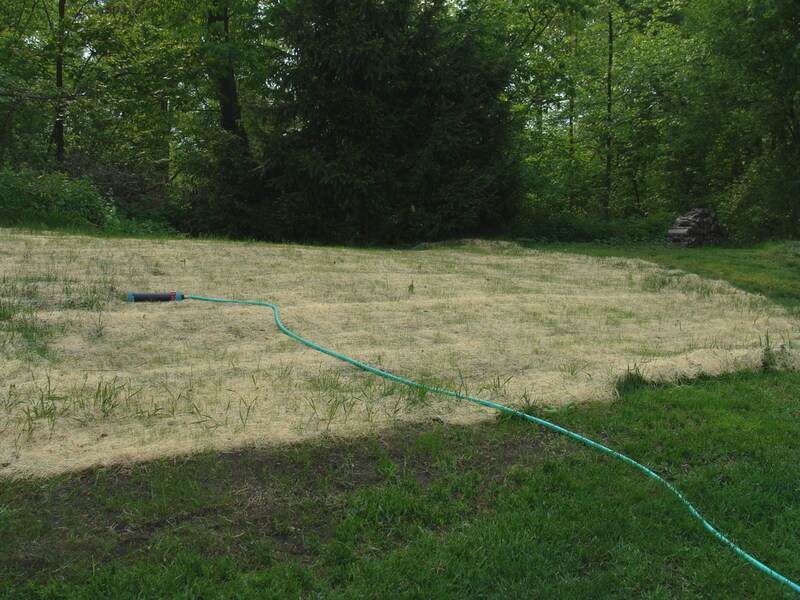 Very frustrated but I cannot go away for two weeks and let my prize winning lawns/veggie garden dry up! What gives? Hi Tom H, I’m not sure which time you have that’s the 49 dollar version. Unfortunately they have quite a few different types of timers. All I can really recommend is to go to Orbit’s web page at http://www.orbitirrigation.com/ and try to find the similar product. It seems like every year these companies come out with a couple of new product lines or have changed the designs. 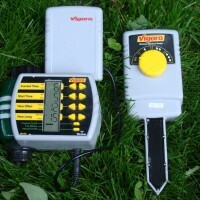 Thanks for the great information on the sprinkler timers, I was considering the Vigoro model, but just wondered about it. THANKS for the tip on going to Lowes for the more expensive Orbit model.I’d seen that one and wondered about it. I am a senior citizen and can’t very well dig my own trench, so this timer just might work for me. I’m glad I helped with finding a sprinkler timer that suited your needs, Bernice. There are so many options out there I just wanted to provide a little bit of info after my own shopping and experience with the things. I know what you mean about digging a trench, my home sits on a bluestone ridge so digging trenches for a sprinkler would involve renting heavy machinery which isn’t in my plans at the moment. I’m having battery problems, just like Phyllis & Pam. I have the Vigoro Two Zone Water Timer, that takes the 4 AA batteries. When I first bought it and put batteries in it flashed “low battery”, I just thought the batteries were old, and bought more (Enegizers) and it worked for a few months then said “low battery”. I put in brand new Kirkland Signature, and it still said “low battery” I tried four others and it still didn’t work, so I bought four new “Duracell Ultra Advanced” and it still says “low battery”. I didn’t keep the receipt and don’t know what to do now. All and any of those batteries should have worked fine, it’s odd that it’s saying low battery. My first guess would be that there’s a poor solder joint inside of the unit and that it’s defective. Some places will take stuff back without a receipt so it’s worth seeing if the place you bought it from does that. If not you might try to contact the manufacturer and tell them your problem. Good luck with finding a resolution! I bought the Vigoro 3015v, and programmed it just fine. One hose in and one hose out. It operates when I turn it to “manual” until the end of one period. There just doesn’t seem to be a setting where it goes into automatic watering mode. I tried leaving it in “program on”, no joy. Same with “Program off” mode. I could achieve the same result by turning on the hose to the sprinklers once a day, but that kinda defeats the idea of an automatic waterer. Thanks for any help — am I missing a button? Hello Bob, I’ve had the same battery problem as the others. Came back from a 9 day trip to find my heirloom tomato raised bed overflowing – the unit failed with one valve open. Low battery light was on and new batteries started a constant whirring until just moments later the low battery light came on again. I can see inside the zone 1 outlet that there is som black piece of plastic or rubber peeking out between the green housing and the valve gate. I think it makes the valve stuck open, the unit tries to close until batteries are low. I used this unit the last half of last summer and all this summer til now. Unless I can get inside to fix, it’s a loss. I purchased for $35, not too bad for almost 2 summers, but now I see the price is $55 – $60… I’ll let you know! I am having the same problem as the others, only I have to vigro 2 zone timers and both have done the same. I have used two sets of new batteries and the wherring sound continues untill the low battery light comes on. The amount of water that has fludded my shrubs and trees, I would think has been running for about three days. I too travel a bit and am scared to go and have malfunctioning while I am away. I will send these back to the company with another $6.00 plus shipping of about $7.00. The money does add up. I don’t know if having a well has anything to do with it or not. I do have two drinking water filters on my well. I wish someone would figure this out. My Vigoro Two-zone worked like a champ until the flashing light thing came up, and it died pretty promptly after that: still flashing the LED intermittently, and not watering at all (my children don’t like this at all, since the missus has them watering). Replacing the batteries has done nothing to help. I live in San Francisco, so our air is pretty moist and kind of salty. Maybe it’s just ordinary exposed circuitry that’s the problem here. It occurs to me that this product is so inexpensive I can afford to replace it and not cry too much, so I think I will do that, if I can still find a replacement. I am having problems programing my timer. Its the orbit model 27752. It keeps repeating the cycle. Hi Beverly, I’m not sure what would be happening, could you explain in more detail how it’s repeating the cycle. Does it turn off and then immediately turn on again? If you’ve followed the instructions in the manual and haven’t set overlapping schedules this should not be occurring and you may want to trade it in for a replacement. That did not help either. The pressure is terrible. I do not have that pressure problem when I by bypass the timer. What do you recommend? Hi Vinnie, sorry for the delay in response. It sounds like a couple of things could be going on there. The valve on your timer may be defective and not opening all of the way. It’s also possible the valve and water passage through the timer itself is too narrow to support the amount of water flow you need for two sprinklers. You may want to use a dual valve or more sprinkler timer so you can run one sprinkler at a time, or look into a timer with a wider valve body. Thanks for mentioning this though, hopefully it will give someone else ideas for their own sprinkler setup. I have had to fiddle with cleaning with the battery contacts and pull them up and the top cover spring down to ensure good contact .. but aside from that .. they have worked well .. I have had a Vigoro 196-036 for 2 seasons and it’s worthless. Water managed to get into the case this year even though it’s a record year for no rain and coroded the battery tabs. It’s no longer functional. Do yourself a favor and pass this junk up.